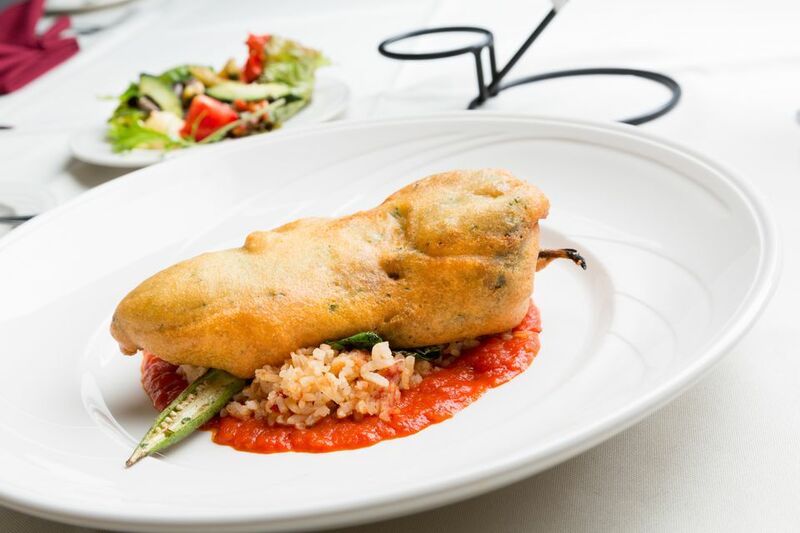 These stuffed green chiles are incredibly flavorful with a touch of heat. You can roast the chiles and make the filling a day ahead, and then stuff them and cook them when you are ready. Roast and peel each chile. If fresh chiles are unavailable, you can use canned whole green chiles. Prepare the Filling: Boil or bake the chicken until it is cooked through. Let the chicken cool and then use forks or your fingers to pull it apart to shred it. Take two of the roasted chiles, cut the stem off and chop them up. Add the shredded chicken and the chopped chiles to a large bowl and add in the cream cheese, queso fresco, cumin, chile powder, and 1/2 teaspoon of the salt. Use a large spoon to smash the cream cheese into the mixture to begin mixing it. You can use your hands to squish it all together. Stuff the Chiles: Insert a sharp knife into the top of the chili, just under the stem and slice downward about halfway down the chile. This will create a slit along the side. Use a spoon or a knife, scrape the seeds and the white membrane out without tearing the chile flesh. You can also do this with your fingers if the chili is soft enough. Place a scoop of chicken filling inside the chili. Use your fingers to pull the chili around the filling and squeeze it slightly to seal it. Repeat with all of the remaining chiles and filling. Set aside. Make the Batter: Crack each egg and separate the whites into one bowl and the yolks into another. Whip the egg whites until they are stiff. Stir the egg yolks in the separate bowl with a fork and a 1/2 teaspoon of salt. Slowly pour the egg yolk mixture over the egg whites. Use a large spatula to gently fold the yolks into the whites until they are almost completely incorporated. A few streaks of yolk is okay. Cooking the Chiles: Heat the oil in a large pan over medium-high heat. Take a chili and dip it into the egg white batter, being careful to keep the chile intact and not let the filling spill out. You may need both hands or a combination of forks or spoons to do this. Gently place the chili into the hot oil and let it cook until the egg white batter is golden brown. Flip the chili over and repeat with the other side. Once the chili is completely golden brown on all sides, remove it from the hot oil and place on a paper towel to drain. Repeat with all of the chiles until they are all golden brown and cooked through. Serve the chiles immediately as they will begin to get soggy as they cool.